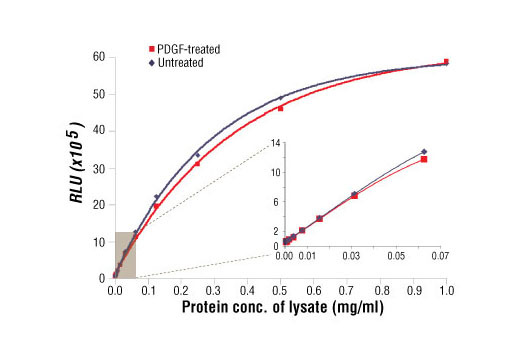 Relationship between protein concentration of lysates from untreated and PDGF-treated NIH/3T3 cells and immediate light generation with chemiluminescent substrate is shown. Cells (80% confluence) were treated with PDGF #9909 (50 ng/ml) and lysed after incubation at 37ºC for 20 minutes. Graph inset corresponding to the shaded area shows high sensitivity and a linear response at the low protein concentration range. NOTE: Refer to product-specific datasheets for assay incubation temperature. This chemiluminescent ELISA is offered in low volume microplates. Only 50 µl of samples or reagents are required in each microwell. Detection Antibody: Supplied lyophilized as a green colored cake or powder. Add 0.5 ml of Detection Antibody Diluent (green solution) to yield a concentrated stock solution. Incubate at room temperature for 5 min with occasional gentle mixing to fully reconstitute. To make the final working solution, add the full 0.5 ml volume of reconstituted Detection Antibody to 5.0 ml of Detection Antibody Diluent in a clean tube and gently mix. Unused working solution may be stored for 4 weeks at 4°C. HRP-Linked Antibody*: Supplied lyophilized as a red colored cake or powder. Add 0.5 ml of HRP Diluent (red solution) to yield a concentrated stock solution. Incubate at room temperature for 5 min with occasional gentle mixing to fully reconstitute. To make the final working solution, add the full 0.5 ml volume of reconstituted HRP-Linked Antibody to 5.0 ml of HRP Diluent in a clean tube and gently mix. Unused working solution may be stored for 4 weeks at 4°C. Detection Antibody Diluent: Green colored diluent for reconstitution and dilution of the detection antibody (5.5 ml provided). HRP Diluent: Red colored diluent for reconstitution and dilution of the HRP‑Linked Antibody (5.5 ml provided). Sample Diluent: Blue colored diluent for dilution of cell lysates. Luminol/Enhancer Solution and Stable Peroxide Buffer. Collect cells by low speed centrifugation (~1200 rpm) and wash once with 5–10 ml ice-cold 1X PBS. Wash 4 times with 1X Wash Buffer, 150 µl each time for each well. Add 50 µl of reconstituted Detection Antibody (green color) to each well (refer to Section A, Step 2). Seal with tape and incubate the plate at room temperature for 1 hr. Add 50 µl of reconstituted HRP-linked secondary antibody (red color) to each well (refer to Section A, Step 3). Seal with tape and incubate the plate at room temperature for 30 min. Prepare Working Solution by mixing equal parts Luminol/Enhancer Solution and Stable Peroxide Buffer. Add 50 µl of the Working Solution to each well. Use a plate-based luminometer to measure Relative Light Units (RLU) at 425 nm within 1–10 min following addition of the substrate. Optimal signal intensity is achieved when read within 10 min. The PathScan® Total Akt1 Chemiluminescent Sandwich ELISA Kit is a solid phase sandwich enzyme-linked immunosorbent assay (ELISA) that detects endogenous levels of total Akt1 protein with a chemiluminescent readout. Chemiluminescence ELISAs often have a wider dynamic range and higher sensitivity than conventional chromogenic detection. This chemiluminescent ELISA which is offered in low volume microplates, shows increased signal and sensitivity while using smaller sample size. An Akt rabbit antibody has been coated on the microwells. After incubation with cell lysates, the Akt protein is captured by the coated antibody. Following extensive washing, an Akt1 mouse antibody is added to detect the captured total Akt1 protein. Anti-mouse IgG, HRP-linked antibody is then used to recognize the bound detection antibody. Chemiluminescent reagent is added for signal development. The magnitude of light emission, measured in relative light units (RLU), is proportional to the quantity of total Akt1 protein. PathScan® Total Akt1 Chemiluminescent Sandwich ELISA Kit #7132 detects endogenous levels of total Akt1 protein in human and mouse cells. This kit detects proteins from the indicated species, as determined through in-house testing, but may also detect homologous proteins from other species.